This is another follow up to the ongoing discussion regarding the announcement that the Federal Reserve plans to discontinue reporting of the broadest measure of the money supply, the M3 data series. A fair amount has been written in the last week, since the previous roundup was done - the original report on this subject first appeared here over two weeks ago. “Money” connotes quite different things to different people. I will attempt to clarify my view that we are at no analytical loss with the upcoming relegation of M3 to the government data scrapheap. First of all, M3 is today definitely not reflective of marketplace perceptions with respect to “moneyness.” With each boom year, the spectrum of perceived safe and liquid instruments expands. This year will see record ABS and commercial paper issuance, with the combined growth of these two categories of financial claims likely in the range of total M3 growth. M3 captures little of this imposing monetary expansion. Market-based securities issuance is now a major aspect of monetary expansion, and the M’s are undoubtedly ill-equipped for such an environment. The unprecedented expansion of GSE obligations (debt and MBS) created several Trillion dollars of perceived safe financial sector liabilities. And while I question the premise that the Fed has much to gain by eliminating M3, this nonetheless misses the much more salient point: The Fed has lost control of our nation’s “money” and Credit creation processes. The Greenspan/Bernanke Fed can now only administer feeble attempts to remove accommodation, hoping that over time baby-steps makes some headway but without ever attempting to impede, interrupt or discipline Wall Street Monetary Processes. From the Federal Reserve Z1 Flow of Funds Report, the following chart shows some of the mortgage components that Doug identifies as not being included in any of the money supply totals today. Notice the leveling off of GSE debt in recent years, as problems at Fannie Mae and Freddie Mac came to light. 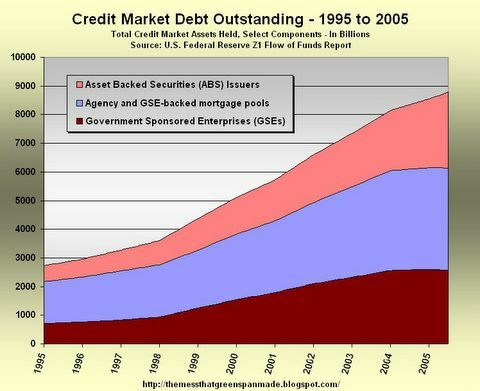 Their credit issuance has been basically flat, while Wall Street's ABS issuance has handily taken up the slack. 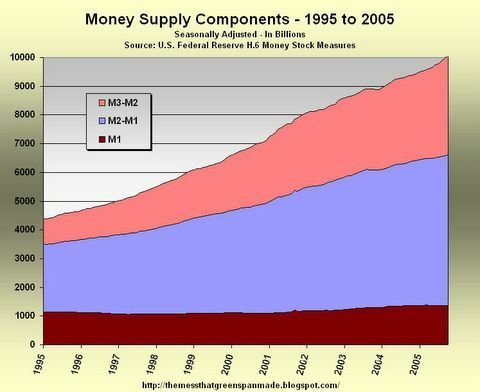 Comparing this with last week's chart of the money supply, using the same scale and duration, it becomes clear that the money supply numbers capture only a portion of what is happening in the financial world today. In fact, going from around $3 trillion ten years ago to near $9 trillion today, the three securitized debt categories are growing at a much faster rate than all of M3 over the last decade - at comparable absolute levels in the $9-10 trillion dollar range. The change in M3 from $4.5 trillion to $10 trillion, about a 120 increase, pales in comparison to the 200 percent increase in the first chart. A chill wind swept across Western Europe, rattling the remains of long-dead Germans who carried memories of wheelbarrows full of worthless deutsche marks to their graves. Stateside, the conspiracy theorists seized on the new information as further proof of deceit and manipulation. In the M3 review, the board staff determined the elimination would save roughly $500,000 a year for the board and Reserve banks and $1 million a year for depository institutions, according to a Fed board spokesperson. In addition, a search of the economic literature yielded very few results for M3. So while the discontinuation of a series very few people pay attention to may have been a surprise, it was not nefarious. Nor was it a prelude to a massive, secretive money-printing operation on the part of the Fed, which is how the hard-core conspiracy theorists are playing it. On Safehaven.com, where fantasy and reality mix, contributor Robert McHugh offered up the answer to why the Fed is discontinuing the weekly report of M3. The PPT is an alleged cabal of government institutions and large banks that intervene to support the markets, most notably stocks and gold. Repurchase agreements, which are among the M3 components to be discontinued, are ``the most obvious reporting item where PPT market buying transactions show up,'' McHugh said. If the theory sounds far out, the accounting is even harder to follow, especially when actions are in anticipation of some future stock-buying binge, as McHugh implies. "Apparently, the Federal Reserve (a key member of the PPT?) sees a coming need to buy -- or facilitate the buying -- of markets, including the equity market, incognito.'' That explains "the extra M3 growth over the past several months.'' can print as much money (buy as many government securities) as it wants, but if the banks don't want the reserves, they will dump them, and the federal funds rate will collapse. That isn't happening. The funds rate has been creeping up every six weeks to 4 percent even as M3 expanded an annualized 10.9 percent in the last 13 weeks. If the markets are rigged, and McHugh has it all figured out, "why is he exposing it rather than telling me how to profit from it or profiting himself?,'' asked Jim Bianco, president of Bianco Research in Chicago. Good point. Don't let reason interfere with a good conspiracy theory. Not defending Robert McHugh here, since anyone reading his commentary would have more than one rasied eyebrow as a result, but there is definitely something amiss in Ms. Baum's analysis when she writes about the accounting being hard to follow. If, hypothetically speaking, you were going to do something really bad that you know would show up in a money supply statistic, wouldn't you discontinue the reporting of the statistic before you did the really bad thing, so that the really bad thing would not be noticed? Wouldn't that be the whole point - to make the accounting hard to follow? And as to the embellished question of Jim Bianco (notice Ms. Baum's words preceding the start of the quote) regarding McHugh seeking profit from this, there is a newsletter available for about $300 per year - it's just a click or two away at the bottom of McHugh's article. Re-reading the McHugh attack a couple times makes you wonder about both Caroline's motives and how her book sales are going (thanks to alert reader L'Emmerdeur for pointing out this connection in the comments section of last weeks post). Something is terribly afoul at the Fed, but the popular financial press offers little but moronic platitudes and attacks on "conspiracy theorists" who dare to question the sanctity of the Federal Reserve Board. I even saw one related comment yesterday from a well known financial reporter who laughed at the concept of there being a Plunge Protection Team that intervenes in troubled stock markets. She cited such a concept as evidence of the absurdity of some conspiracy theories. The Federal Reserve, not the Treasury, generally is the ultimate backstop for the financial markets. Sometimes the Fed does intervene on behalf of the Treasury, particularly in the currency markets. Despite Mr. Greenspan's denials of Federal Reserve Involvement in stock market intervention, I have had a former Fed official confirm to me that interventions, at times, have been coordinated by the New York Fed. What game the Federal Reserve is playing will become clear soon enough. Chances that M3 was eliminated because it just duplicated M2 are nil. The cost factor also is a canard. The Fed could privatize monetary reporting, if it wanted to, the same way the government put the Index of Leading Economic Indicators out to bid. Last Friday I wrote last about the astonishing lack of comment outside of investment letters and the financial blogosphere about the Federal Reserve's curiously discreet announcement that it intended to stop publishing data on the broadest monetary aggregate, known as M3. Baum has an iconoclastic manner but she usually comes down on the side of Wall Street orthodoxy. A recent example was her Oct. 24 column sneering at the Sprott Asset Management paper documenting the evidence that a "Plunge Protection Team" exists to support the stock market at crucial moments. Her argument essentially was that none of her friends admit it exists, so it can't. Baum's Nov. 22 column on the M3 controversy did acknowledge a peculiar lack of consultation. She quoted Maurine Haver, president of Haver Analytics and chairwoman of the National Association of Business Economics statistics committee as saying, "It doesn't seem they reached out very far to get user feedback on the discontinuation of the series." Mr. Brimlow is of course referring to this prior work by Ms. Baum about the non-existence of the Plunge Protection Team, where she voiced disdain for the Sprott Asset Management Report on market intervention (warning - PDF). Interesting reading, especially in light of the much talked about trader 990N. At the New York Post, John Crudelle asks What's the Fed Up To? Bernanke is the guy who said a couple years ago that if the government's monetary policy wasn't working, Washington could just print money to get the economy going and drop it from helicopters. That's OK for a professor lecturing to freshmen, even the bright ones in the Ivies. But that's not the sort of thing that inflation-wary professionals on Wall Street are accustomed to hearing. And in the very unlikely event that the government took Bernanke's advice, where would that shocking breach of monetary policy show up? In the M3 figures that are being discontinued, of course. David Chapman provides a nice summary of the issue in What's Happened to M3? M3 is very important. Indeed of the Fed's monetary numbers only M3 was of major importance and in other G7 countries we also focus on M3 including our own Bank of Canada. No word that they intend to follow. So why are they dropping M3? Well we have seen nothing to tell us why we only know they are doing it. Oh it's not that the numbers will completely disappear. For those that wish to take the time they can pore through the Flow of Funds accounts (released quarterly as Z.1 release and the H.8 bulletin released weekly for commercial banks) and piece together the former M3. Painstaking, but that is not the way it is supposed to be. European Central Bankers put great stead in M3 so why has the Fed after all these years decided to cease publication? I'm still somewhat surprised by the sentiment that the Board's decision is, at least in part, motivated by the desire to downplay a statistic that appears to be contradictory to the achievement of price stability. I'm surprised because such sentiment seems to imply that the FOMC places significant weight on the behavior of monetary statistics in the first place! If you have a sense that M3 is providing any information at all related to the objectives of monetary policy, you know something I don't know. There seems to be a growing disconnect between what people are told the rate of inflation is, and what they experience in their own lives - and not just for energy. Healthcare, tuition, and many other service categories have been rising sharply, while at the same time the cost of imported goods remains stable or declines (how many DVD players do you really need?). "The question that my constituents ask me, I'm going to ask you, 'If the economy is so good and inflation is so well behaved, and there's price stability, then why does everything cost so much more when you go to buy something?" Not just energy, "everything" (exclusive of DVD players, probably). Over the last ten years inflation as measured by CPI-U has been in the 2-3 percent range, whereas money supply growth has been in the 5-10 percent range, with the fastest growth coming from the M3-M2 component, the reporting of which is being terminated. The sense that I get is that the rise in prices felt by consumers is higher than what is being reported in government inflation statistics, and that past and future M3 growth is the uncomfortable confirmation of this. You'll have to read the rest on your own, or maybe they'll get updated later in the day. Sol Palha - M3 reporting: What’s The Big Deal? eh, not sure about the debit part. but you could say monetary policy = slavery. Attributed (see updated post) - I'd say the comment was closer to seven-eighths intelligent. This is fair warning for the smart kids in the front row to load up on precious metals. For the jocks in the back, we're lowering house prices for you. Given Doug Noland's thought provoking comments regarding the M3 deficiencies, it would seem that the Fed -- as a corporation within our free-market capitalistic system driven by the competitive marketplace toward excellence and the need to provide more choices for the American economic data consumer -- should enhance rather than eliminate M3 reporting. Instead the Fed announced without explanation that they were discontinuing publication of M3 (is it significant that they said publication -- not collection of the data?). I've seen two non-conspiracy arguments advanced for the discontinuance: (1) the data does not influence monetary policy decisions and thus is outside the Fed mandate, and (2) the cost of publication exceeds it's value (two people said to work on it). Awww, I was only messing with you. That last anonymous comment - I had the same idea. Might be an interesting business opportunity, if the raw data still exists to put an ad-hoc M3 estimate together. response to 2 comments up: The truth may very well be it does not influence monetary policy. But part of the government's job is to allow us to make well informed decisions. I think our Fed's true focus is the currency market, the monetary policy is just the by product. Ie. strong dollar = deflationary pressure, weak dollar = inflationary pressure. we control the dollar with the rates. This is the very reason why it is convienent that our Monetary policy is based off of an "interest rate" and not money supply or a gold standard. On Nov. 10 the central bank issued a tersely worded statement that it was planning to discontinue publishing its widely followed M3 money supply data. This really set the conspiracy theorists buzzing. Aside from its importance as a gauge of Fed policy, M3 has been expanding at an increasing pace. It's currently growing at a 7.5% annual rate, up from 5.6% at the end of last year. On the other hand, the growth rate of M2 money has slackened, from 5.6% last year to only 4% today. To some, this smacks of setting the stage for faster money growth. I'm reminded of 1967, or thereabouts, when the government stopped publishing statistics on defense spending, ostensibly to hide the scope of the buildup in Vietnam. From the standpoint of monetary authorities, charged with the responsibility of regulating the money supply, none of the current definitions of money make sense. The definitions include numerous items over which the Fed has little or no control, including many the Fed need not and should not control. The definitions also assume there are numerous degrees of "moneyness", thus confusing liquidity with money (money is the "yardstick" by which the liquidity of all other assets is measured). The definitions also ignore the fact that some liquid assets have a direct one-to-one relationship to the volume of demand deposits (DDs), while others affect only the velocity of DDs. The former requires direct regualtion, the latter simply is important data for the Fed to use in regulating the money supply. At first under the DIDMCA of March 1981, M1A was our means-of-payment money supply and M3 was mudpie. Eventually, over a long time, our means-of-payment money will approximate M3. We are presently enjoying a most exceptional advance of productivity thanks to both unprecedented technological innovation and economic progress resulting from globalisation. Under a gold standard such massive productivity gains would result in rapid increase of buying power. Under the present system without any gold backing our real living standard is on the contrary declining despite this most exceptional progress. Why is there still inflation when it is presently costing only half the price to produce it did cost 10 years ago for products like electric and household equipment, textiles and air travel, down even to 10% only for items such as or picture prints, computers, mobiles, printers….? The reason is that the monetary policy of the FED (as well as the ECB) are deliberately targeting an inflation rate of about 2% and thereby deliberately prevent the average price level from declining and people’s buying power from rising. For the purpose of the matter central banks keep interest rates at an inflationary low level, generating excessive credit demand an (asset) inflation. By targeting inflation at 2% central banks prevent increased productivity benefiting to the average consumer. As long as the gold-backed money standard is not restored only a money supply rate near to the growth rhythm of the real economy could prevent inflation and allow purchase power to keep up with productivity. Any growth rate above this rhythm is inflationary in the true sense. Inflation targeting therefore in practice means nothing less than institutionalised confiscation of all prosperity gains resulting from progress. The FED’s August M3 money supply rate is not at the growth rate of the real economy of some 2%, but has just reached its fastest rate in 35-years (about 14%). This means that for the moment a 14% larger amount of money is chasing a quantity goods and services that is hardly 2% larger than twelve months ago. Consumer Price Indices are not representative for real inflation. By definition they cover consumption items only as asset prices are unaccounted for. The CPI also does not ponder the lowering quality of goods as it compares today’s low quality import stuff with the top quality domestic produce we were used to a few years ago. In Europe the fastest rising items such as oil or cigarettes and most importantly taxes do not even figure on the CPI list just as if these were unimportant details in the family budget…. I wonder what the M3 would look like over the past 6 months if it were published? Good call on the idea that the Fed would stop producing the M3 *before* the statistic told a gruesome tale.